Creating elevation diagram with free templates and examples. Elevation diagram has never been easier. An elevation diagram is a flat, non-perspective, two-dimensional technical drawing of a building's facade seen from one side. Elevations are typically drawn at the same scale as the floor plan. It is labeled based on the direction it faces on a compass. This is the most common view used to describe the external appearance of a building. Each elevation is labeled in relation to the compass direction it faces. Elevation drawings, which show the vertical location of process equipment in a building, are useful for checking equipment and performing startups and shutdowns. 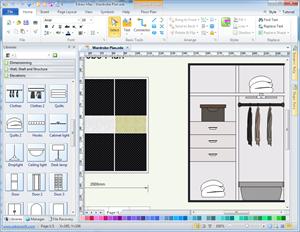 With Edraw software, you can zoom in, edit, and print all our sample diagrams for it is often easier to modify an existing diagram than to draw it from scratch. Anyone can quickly and easily create elevation diagrams with Edraw's automated elevation diagram software. 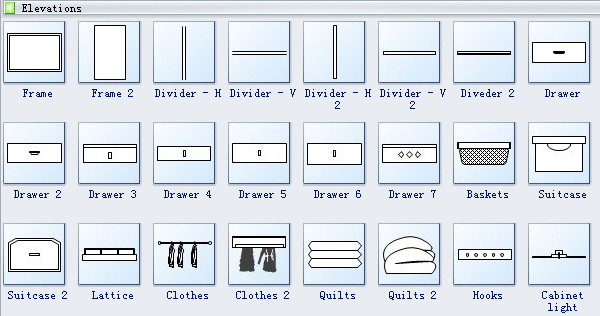 You can create elevation diagrams for cabinets, house design and kitchen plan. Just directly drag and drop the ready-made symbols and format your drawing with the powerful tools, you can finish a drawing just in minutes, and even don't need any professional drawing skills. What's more, Edraw supports exporting the file to PDF or other graphic formats. 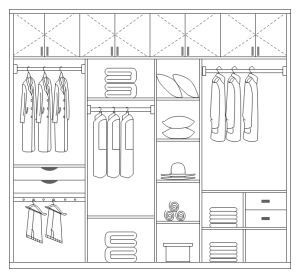 A well-designed checkroom plan template is available in vector format to help users create checkroom plan quickly. 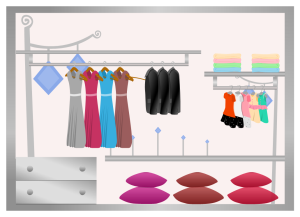 A coatroom design example is presented to help users with innovative ideas in desining coatrooms. Download this vector file and use it as a template for fast designing. 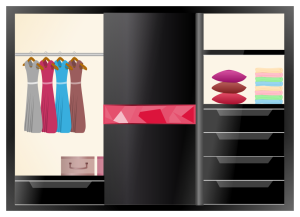 A well designed wardrobe design example is ready to use in vector format for your own creation. 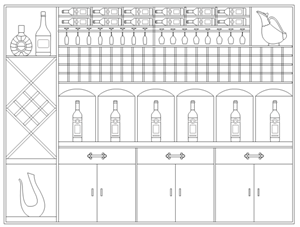 A wine cabinet elevation example is provided to show the visual result of Edraw Wine Cabinet Elevation Design Tool. Download this vector file and use it as a template for fast designing.